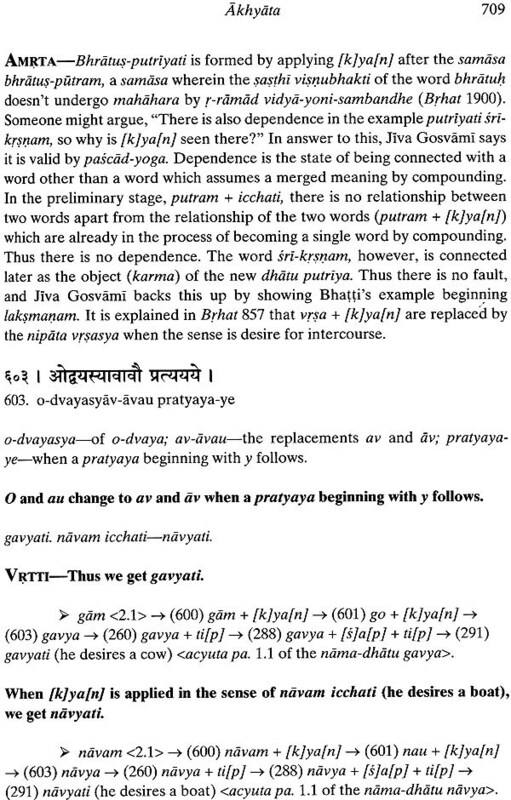 In Hari namamrta-vyakarana, Jiva Gosvami Perfected the methodology of teaching Sanskrit grammar. His treatise is clearer and more complete than Panini’s Astadhyayi, and is filled with examples centered on the Lord. In addition, Jiva gosvami used the Lord’s names as grammatical terms, and thus reflected Sri Caitanya Mahaprabhu’s opinion that all words and their roots are sourced in Sri Krsna. 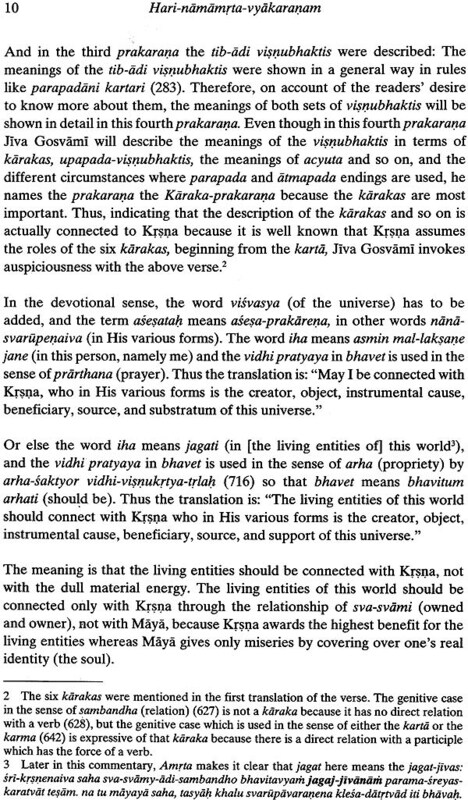 In this edition Matsya Avatara Dasa selected the most important sutras composed by Jiva Gosvami. Notably, these sutras cover all the different types of usage found in the Bhagavata Purana and in Gaudiya literature. 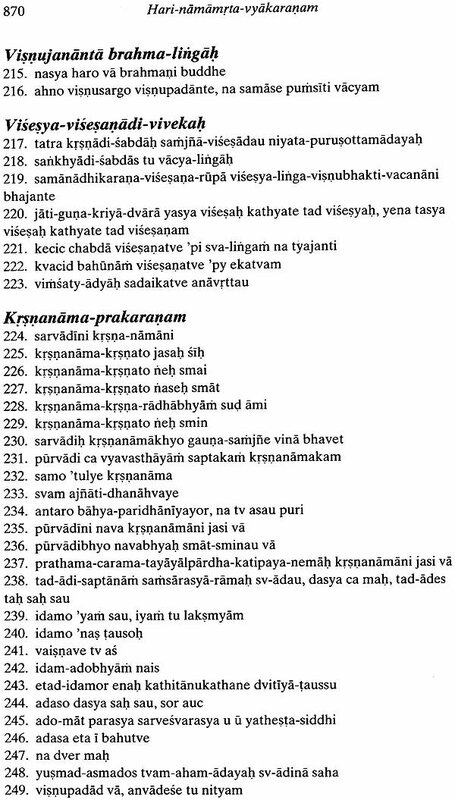 He also translated the two commentaries on Hari namamrta namely Amrtasvadini and Bala-tosani and included his own commentary, called Samsodhini, which provides further clarification and additional information on the topics covered by Jiva Gosvami. Hari-namamrta-vyakarana is the best treatise on Sanskrit grammar. In a clear way, Jiva Gosvami included both the rules set by Panini and the additional rules written by Katyayana (Varttika), Patanjali (Mahabhasya) and others. 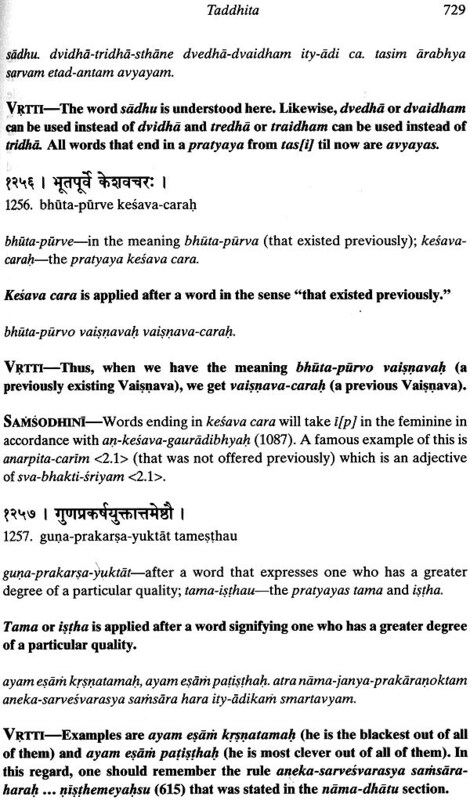 On occasion, Jiva Gosvami himself created rules to reflect the usage of the Sanskrit language in the Puranas. 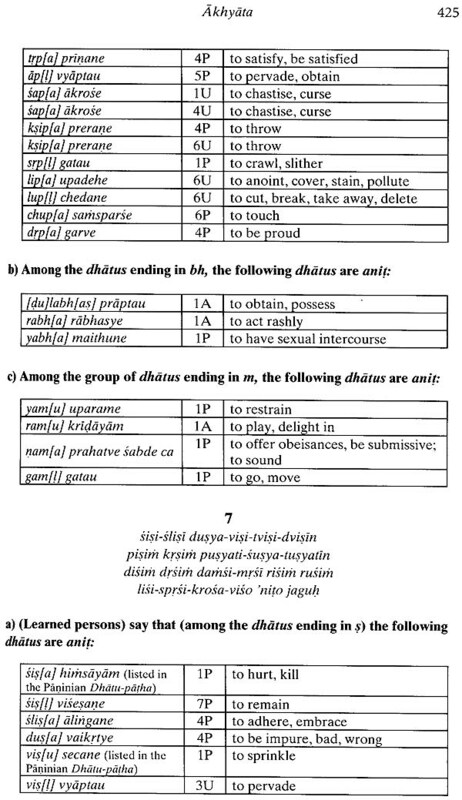 The Sanskrit language was primarily a spoken language: The rules were made to reflect the usage in the bhasa (spoken language) and in the scriptures. 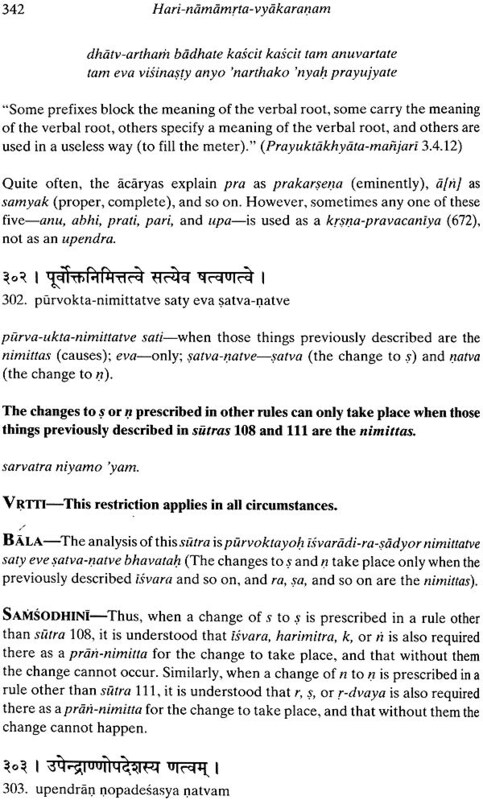 Every full treatise on Sanskrit grammar must contain at least seven chapters (prakaranam) on the classical topics. 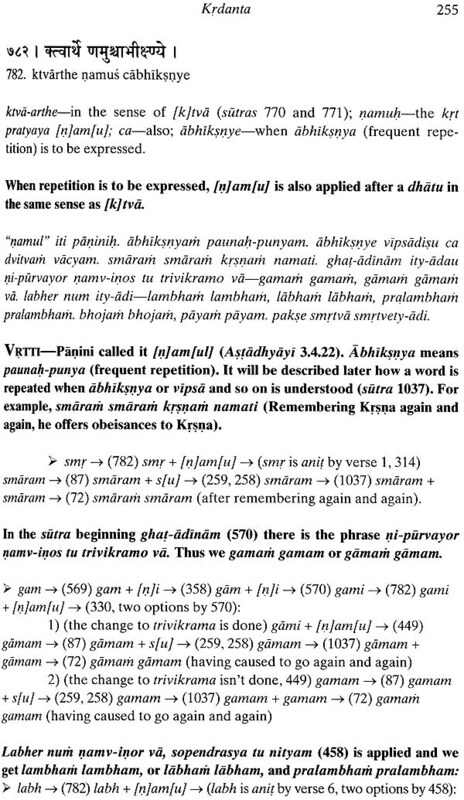 In his treatise, Jiva Gosvami composed 3181 sutras. This is called the Brhat version. 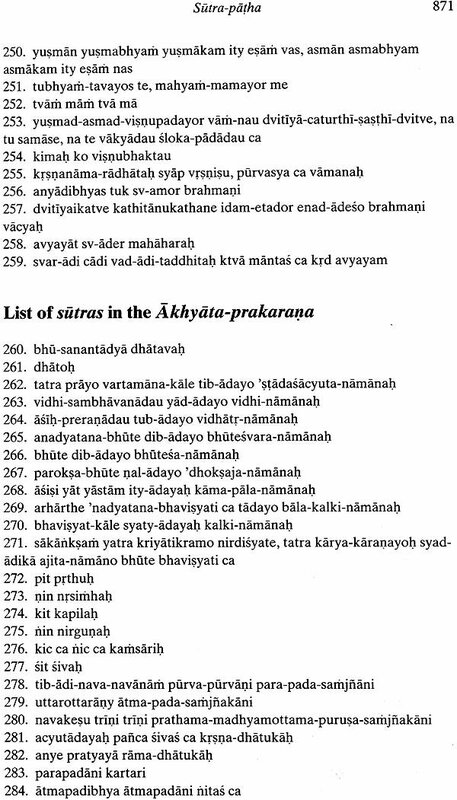 Of these, Matsya Avatara Dasa selected the most essential ones, 1273 sutras in total. He calls this the Madhyama version, or the course version: These are the sutras presented here. 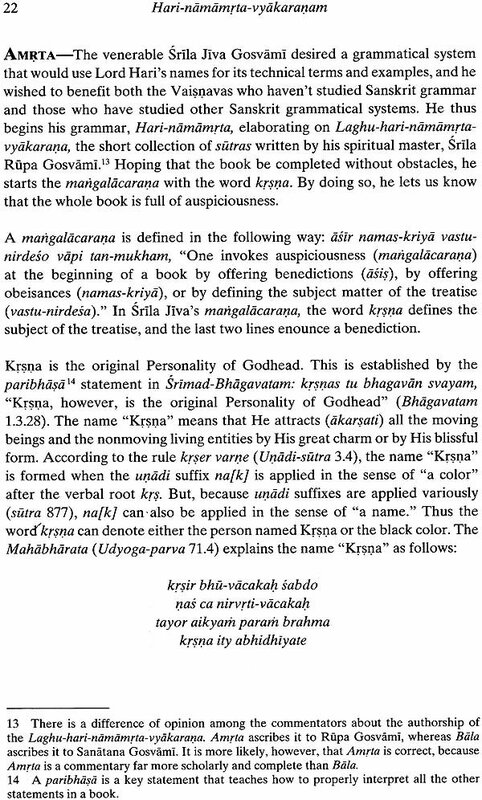 This is the material Matsya used when he taught Sanskrit at Gopiparanadhana Prabhu's Sanskrit School in Govardhana for six years (2005-2011) and in Vrindavan for three more years after Prabhuji's departure from this world. 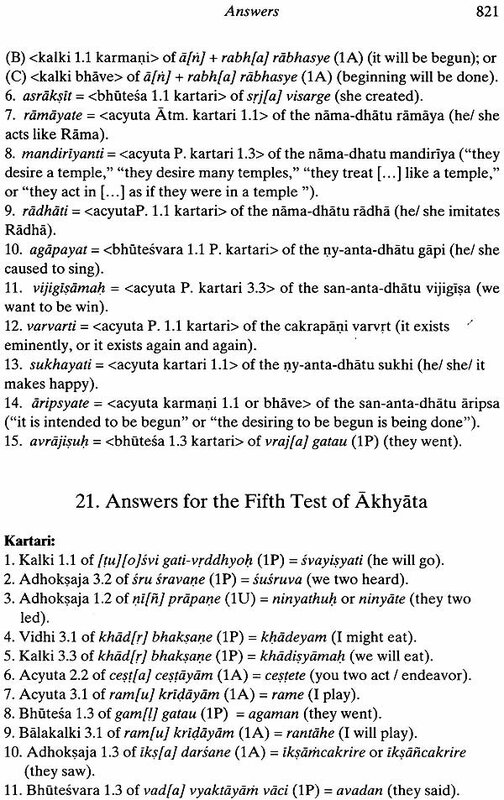 During his class on the acaryas' commentaries on the Tenth Canto of Bhagavatam, Matsya would make us, the students, reference the sutras by heart to explain the words and the syntax therein, and would make us do the same at the end of each grammar class upon showing us a rasika verse from one of the acaryas. 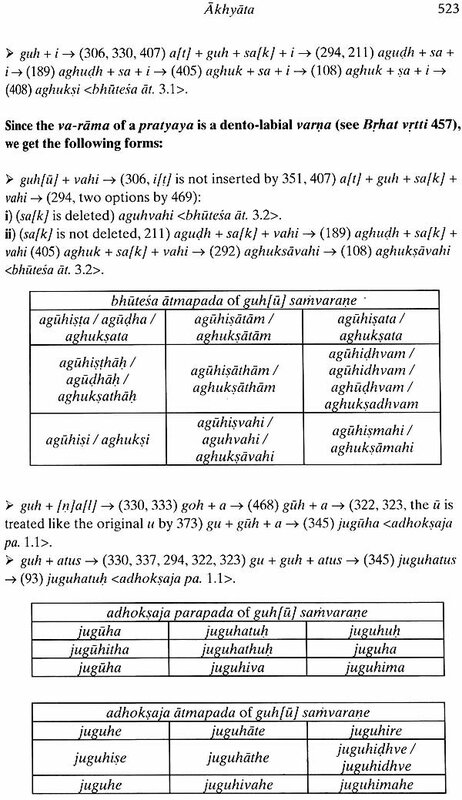 Similarly, Bhattoji Diksita's Vaiyakarana-siddhanta-kaumudi, the most popular treatise in the study of Panini's Astadhyayi, has three shorter versions, called Madhyama-siddhanta-kaumudi, Laghu-siddhdnta-kaumudi, and Sara-siddhanta-kaumudi, All three are the work of Varadaraja. 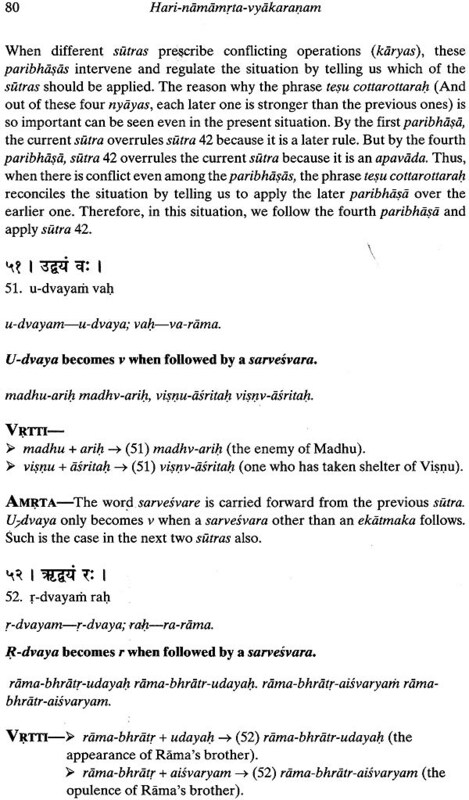 Matsya's Madhyama version of Hari-namamrta-vyakarana corresponds to Madhyama- siddhanta-kaumudi. 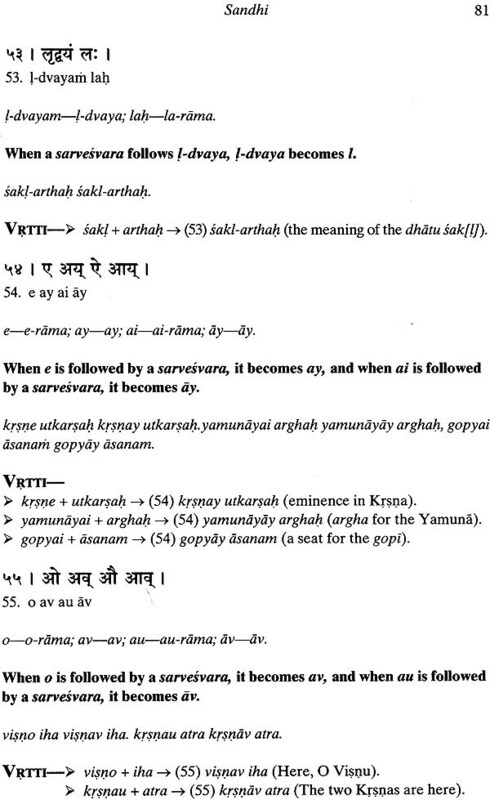 Further, Matsya created a very concise version of Hari- namamrta-vyakarana, called HNV sara. That version is taught at VIHE in Vrindavan. 96. Harinamamrta. - There are two works going by this name. The one by Rupagosvamin, the companion and disciple of Chaitanya (1484- 1527) and the author of several other Vaishnava works, is perhaps the older of the two. The peculiarity of this work is the employment of various names of Krishna and Radha, and of their acts, not simply by way of illustration but as actual technical terms. 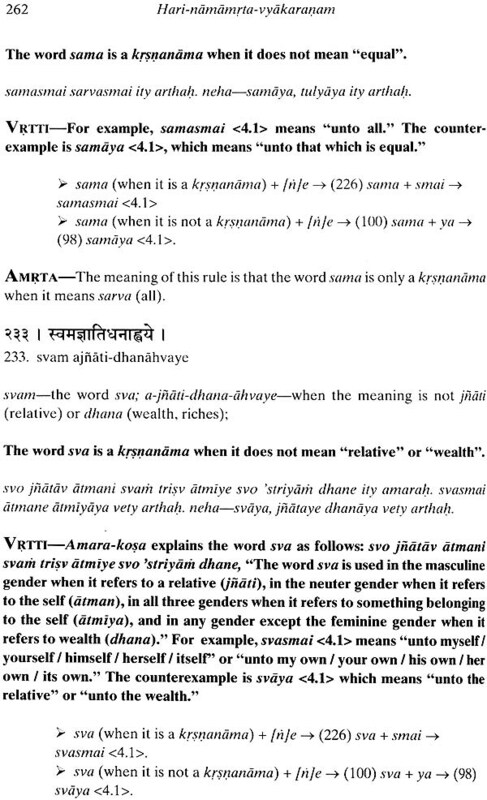 [ ... ] Jivagosvamin's Harinamamrta varies only slightly from the above. 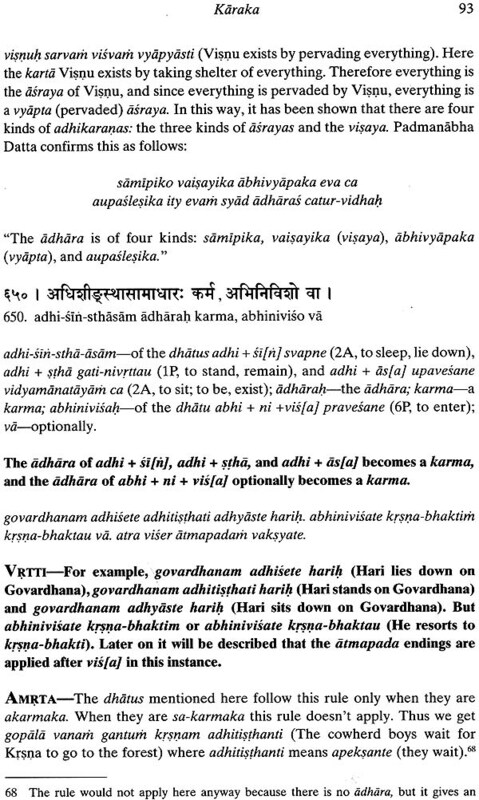 A third Vaishnava grammar called Chaitanyamrita is likewise mentioned by Colebrooke. 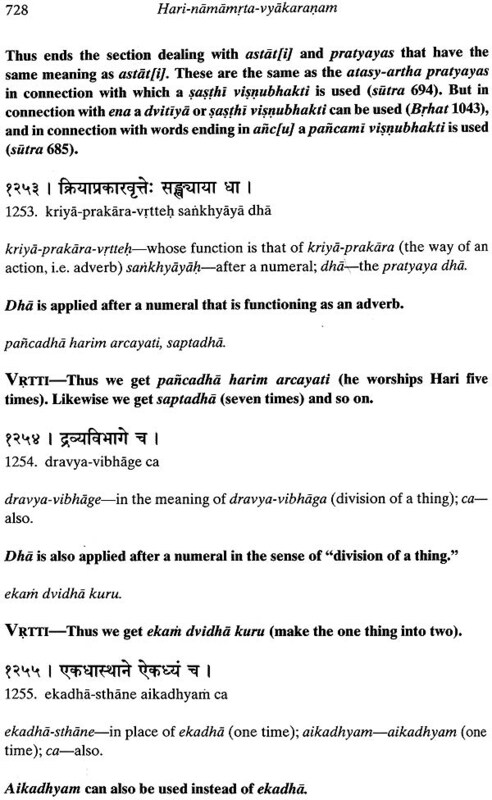 Thus, the first Hari-namamrta was renamed Laghu after the second one was composed. 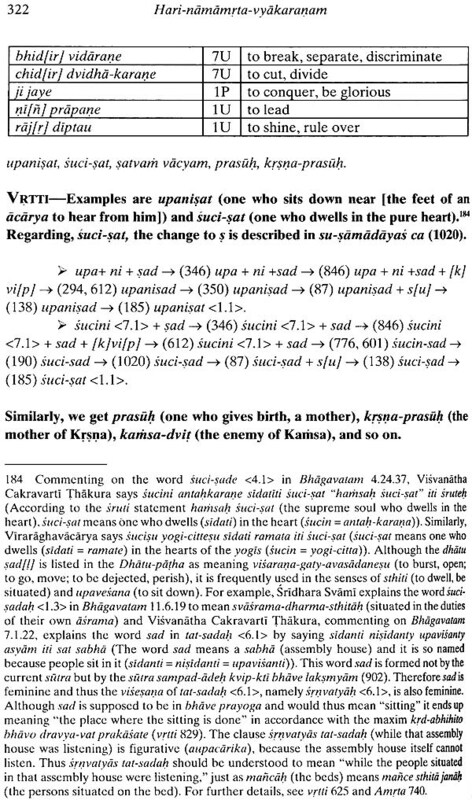 However, Haridasa Dasa, a renowned encyclopaedists, does not mention the first work at all. 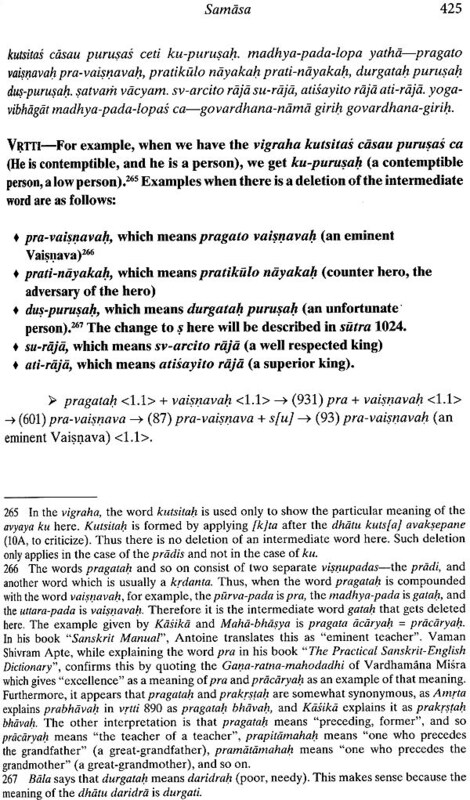 Rather, in his section on grammar he only says Rupa Gosvami wrote Prayuktakhyata-candrika (Prayuktakhyata-manjari) and Jiva Gosvami wrote Sri-hari-namamrta-vyakaranam. 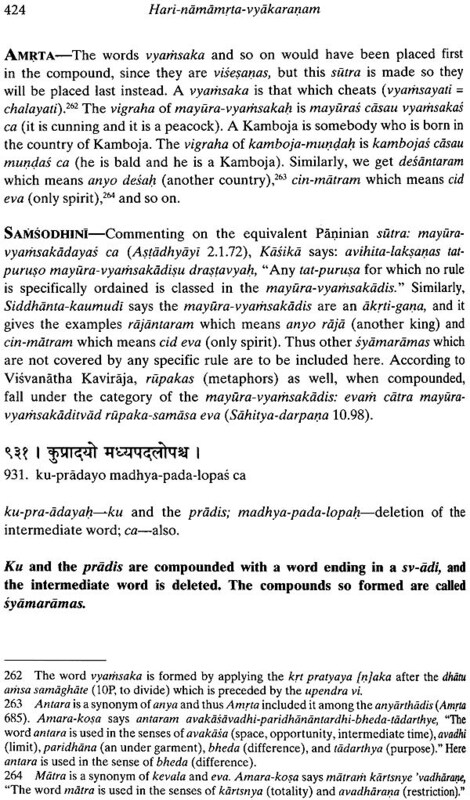 Further, according to Haridasa Dasa, the 'third' Vaisnava grammar, which he mentions in his List of unavailable works on grammar, is attributed to Kavi Karnapura: kavi- karnapure sri-caitan ya-caritamrta-vyakarana aropita hoiyacche. 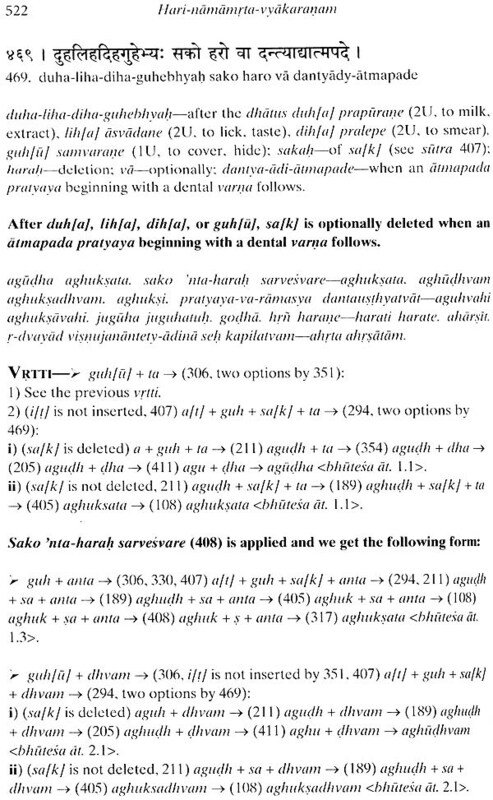 Srila Jiva Gosvami compiled a grammar in two parts, named Laghu- hari-namamrta-vyakarana and Brhad-dhari-namamrta-vyakarana. If someone studies these two texts in vyakarana, or grammar, he learns the grammatical rules of the Sanskrit language and simultaneously learns how to become a great devotee of Lord Krsna. 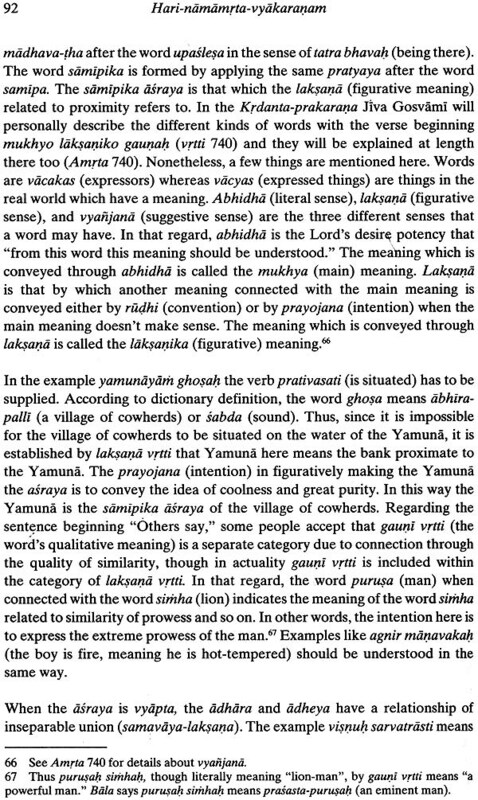 There are yet others who posit that Sanatana Gosvami is the author of the Laghu. 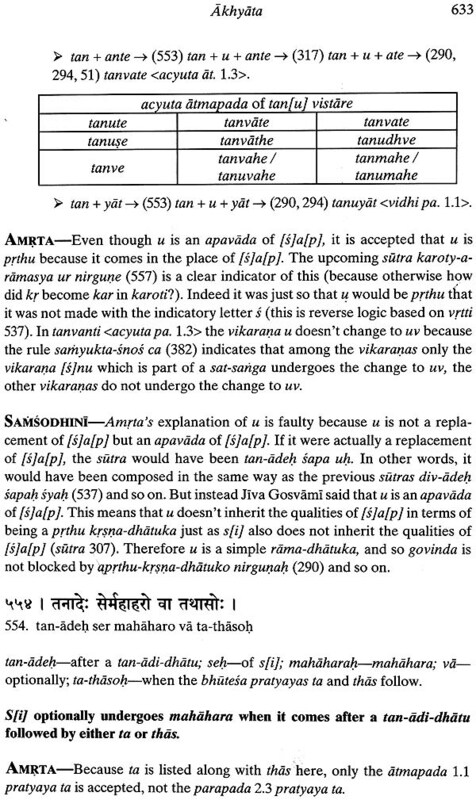 However, Amrta, the most complete and authoritative commentary on Jiva Gosvami's Hari-namamrta, states that Rupa Gosvami is the author of the Laghu." This is corroborated by a manuscript of the Laghu found in Bengal by Dr. Demian Martins, a reputable modern-day Sanskrit scholar. The image below is his scan of the last page of the manuscript. 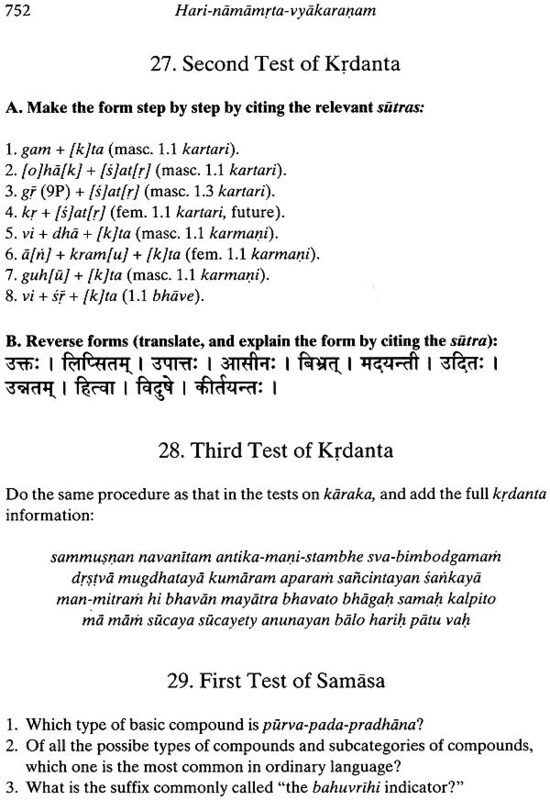 The text is Sanskrit written in Bengali script. 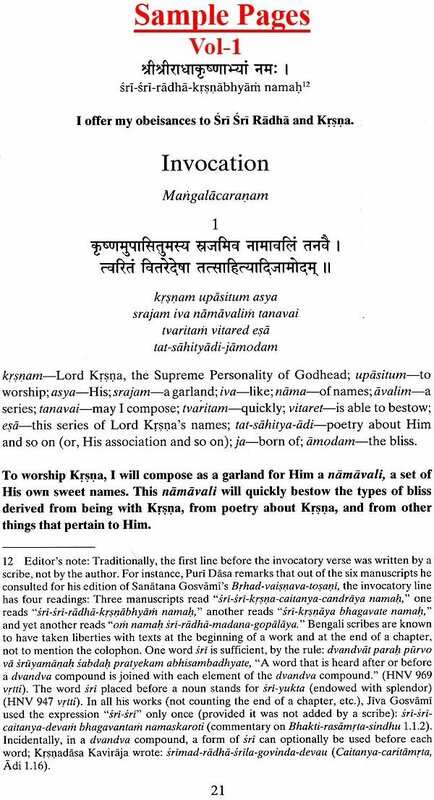 The colophon, the text after the two ornate designs in the middle of the manuscript, states that Rupa Gosvami is the author: iti srimad-rupa-gosvamina viracitam hari-namamrtakhyam vaisnava-vyakaranam samaptam. 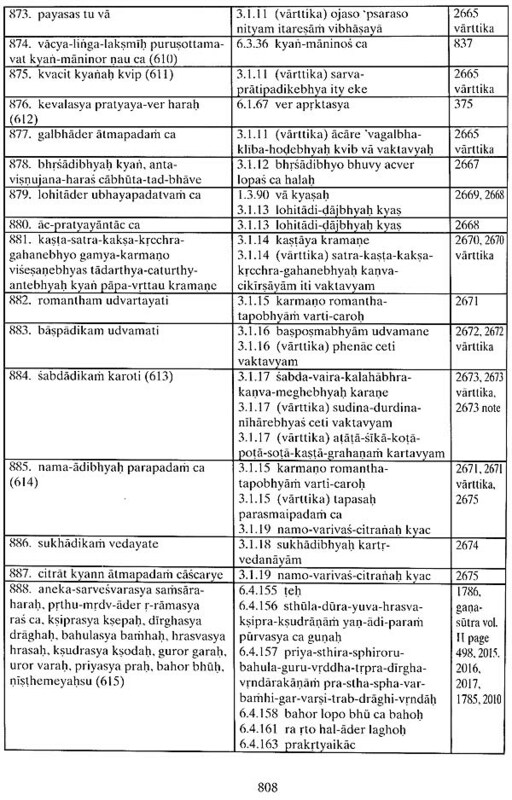 The first half of the manuscript shows that the work was extremely concise both in length-the topics do not go beyond the akhyata-prakarana and in the details. Those few lines of text, before the colophon, correspond to sutras 569 to 618 in Matsya's course version; the wording is exactly the same in Jiva Gosvami's treatise. Those words are found either in his sutras or in his vrtti. 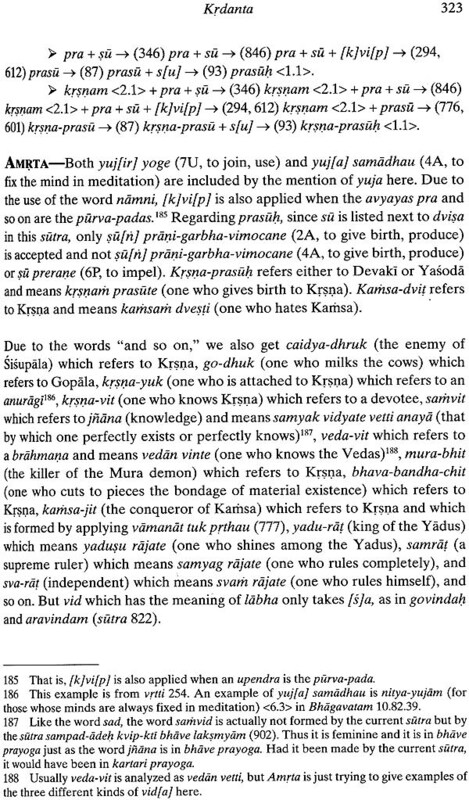 sarva-sastre 'krsna' bai nai balaye ana"
Jiva Gosvami studied an astounding number of grammatical treatises. Indeed, from the various references he gives throughout his book, we know that he studied Panini's Astadhyayi along with its various commentaries such as Katyayana's Varttikas, Patanjali's Maha-bhasya, Vamana and Jayaditya's Kasika, and Bhasa-vrtti and Bhdga-vrtti. We also know that he studied Sarvavarma Acarya's Katarura-vydkarana, Vopadeva's Mugdha- bodha-vyakarana, Kramadisvara's Sanksipta-sutra-vyakarana, Candra Gomi's Candra-vyakarana, Padmanabha Datta's Supadma-vyakarana, Anubhiiti Svarupacarya's Sarasvata-vyakarana, and Ramacandra Acarya's Prakriya- kaumudi along with their respective commentaries. 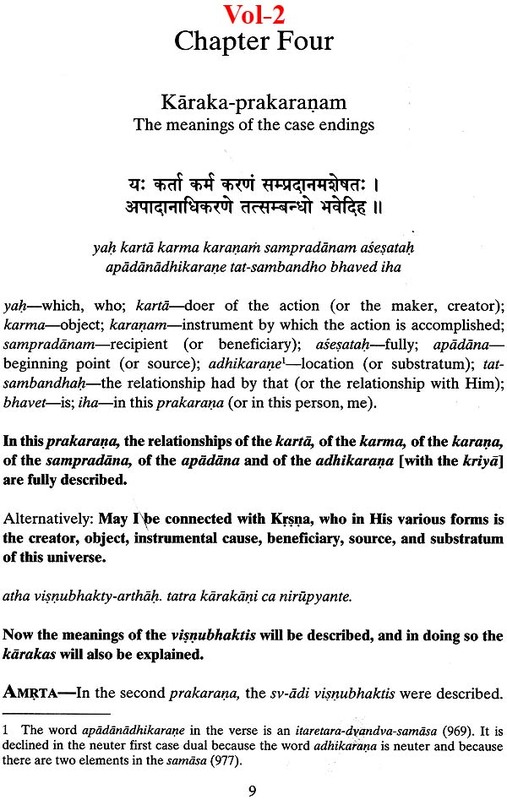 Of those, Katantra-vyakarana and Sarasvata-vyakarana are incomplete by themselves, and Sarasvata-vyakarana and Prakriya-kaumudi are fraught with mistakes. 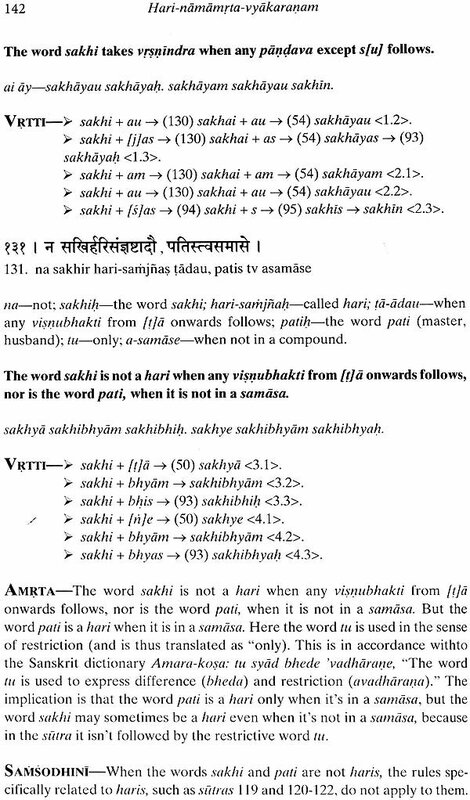 Panini's Astadhyayi itself is impossible to understand without the help of multiple commentaries because it is too concise and because the wording is very difficult to understand. For example, to learn the rules of grammar in the Paninian system, one has to first read Panini's sutras, then consider the additions and amendments found in the Varttikas, and then read the great commentary called Maha-bhasya. 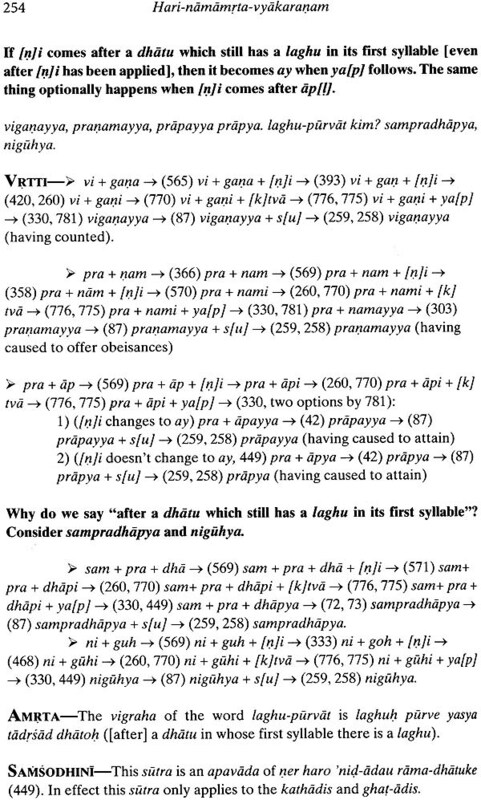 And if one wants to understand every sutra deeply, one also has to study Kasika and its sub commentaries (Nyasa and Pada-manjari), since the Maha-bhasya comments only on or third of Panini's sutras. At present, people generally study Panini's grammar through Siddhanta kaumudi (a book written by Bhattoji Diksita, a contemporary of Ji, Gosvami), which rearranges Panini's sutras into topical divisions. 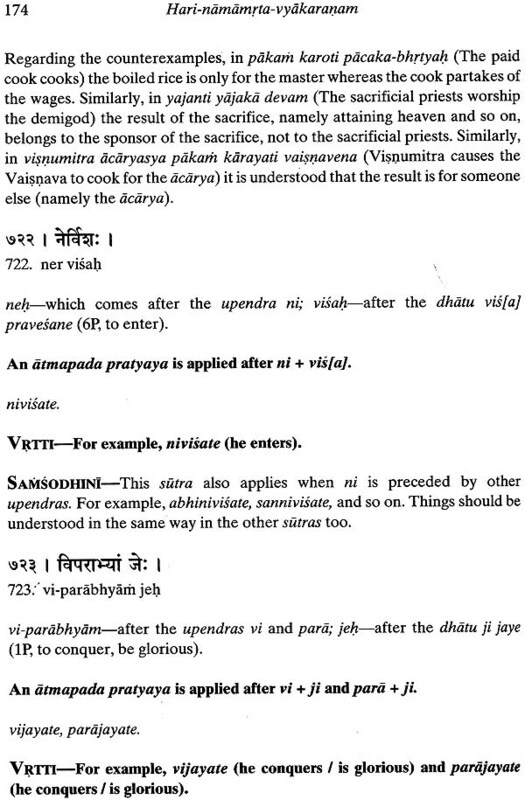 But this introduces new ambiguity and confusion, because the natural flow (anuvrtti) of Panini's sutras is broken, in the sense that Panini designed his sutras so that sometimes one term in a sutra is also carried forward to a later sutra. Jiva Gosvami's grammar, however, is unparalleled because he collected the essential teachings of all these grammatical works and put them together in a clear, precise, and Krsna-conscious way. The manner in which he designed the sutras is such that they are easy to understand and their meaning unambiguous. 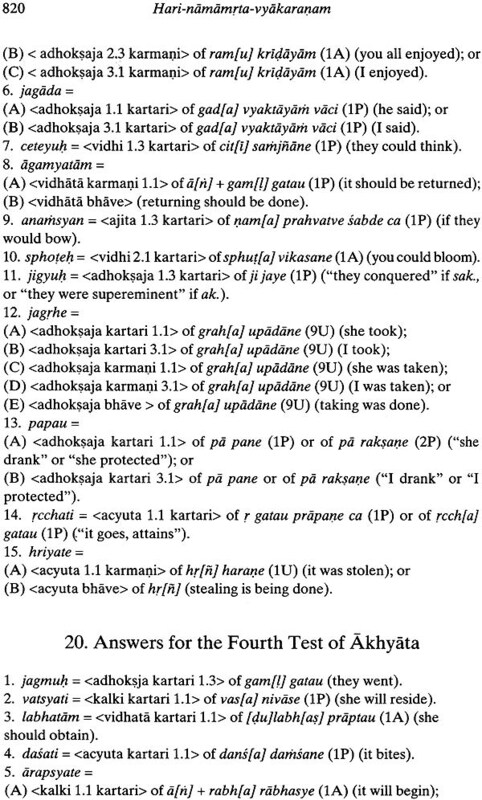 Therefore Jiva Gosvami's grammar excels all others both in its grammatical content and in its spiritual value. 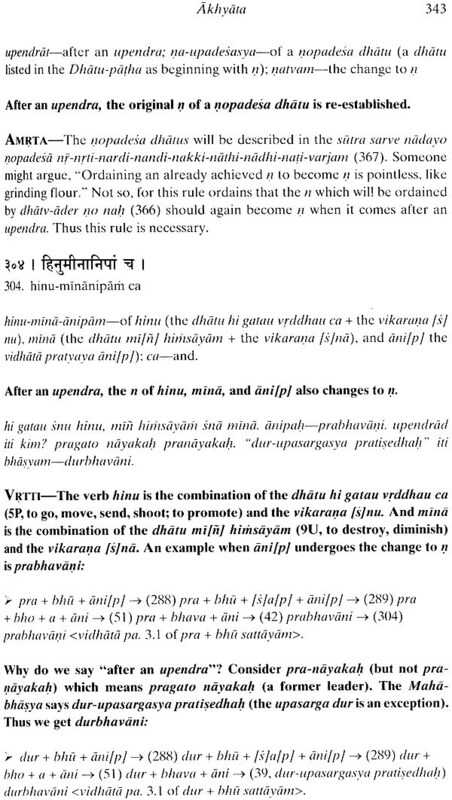 Jiva Gosvami wrote both the sutras and the vrtti. 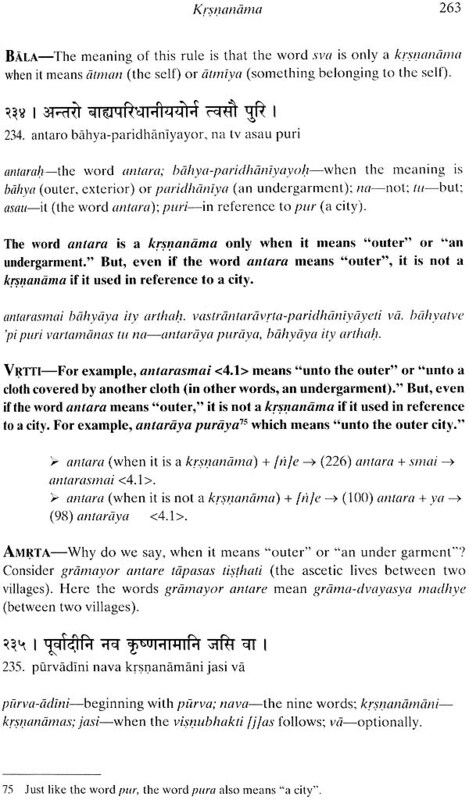 A sutra is a rule, and in this context the term vrtti denotes the author's commentary. This book features two additional commentaries: Amrta and Samsodhini. 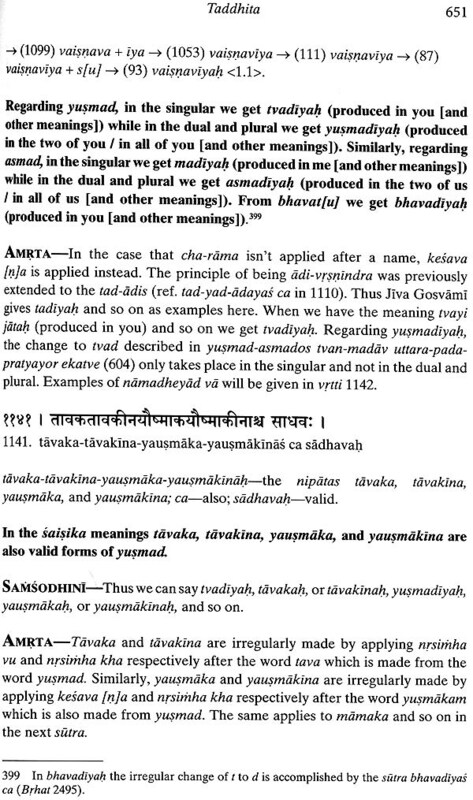 The Amrtasvadini-tika. or Amrta for short, was a commentary written by a Vaisnava named Gopa dasa. 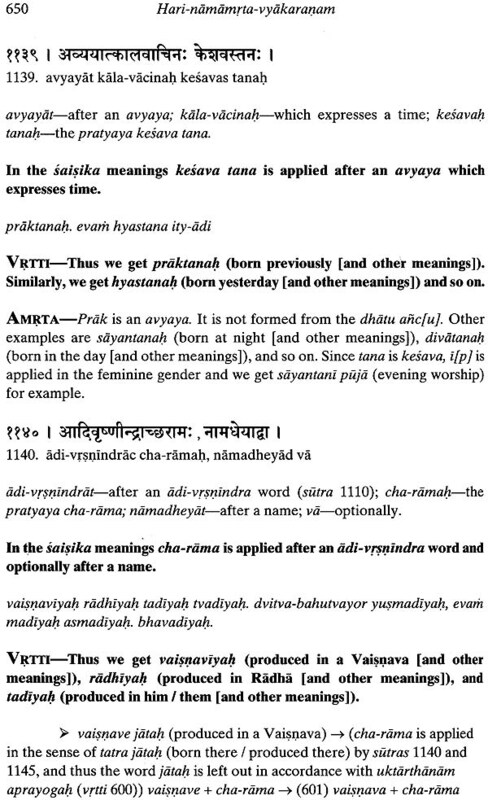 The name Amrta-asvadini means "It causes one to relish nectar," an tika means "a commentary." What kind of amrta does this commentary make us drink? 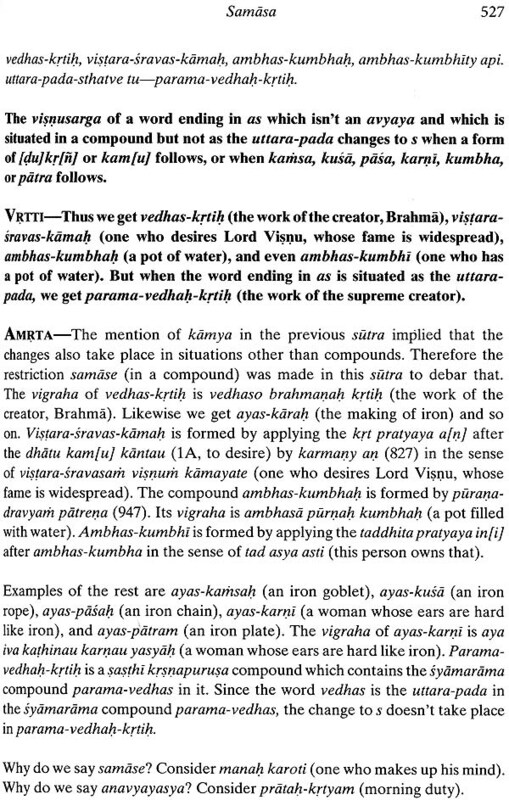 The Hari-namamrta. This commentary allows us to understand in detail what Jiva Gosvami wrote in his Hari-namamrta-vyakarana. In this book I have presented Amrta in a summary study form. In total, about ninety percent of the content of the original Amrta commentary is covered here. 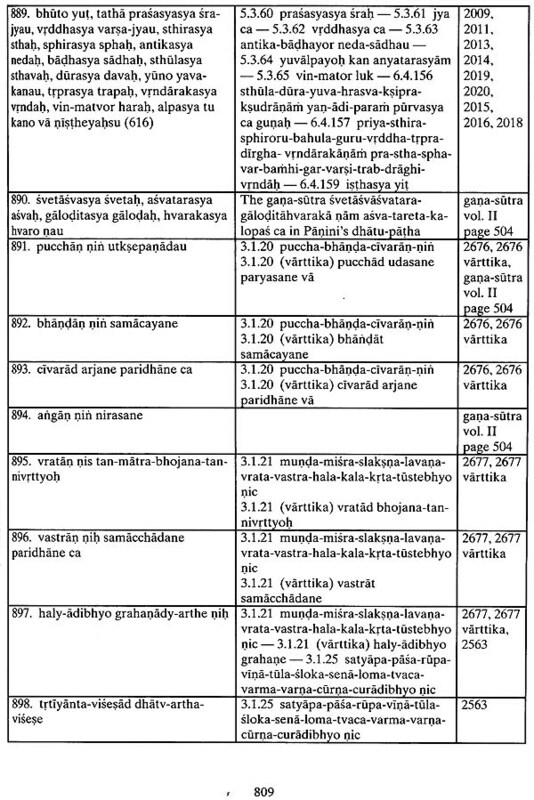 I have also included select parts of the Bala-tosani commentary here an there, when it covers something not covered by Amrta. Bala-tosani meal "It satisfies the children or beginners." As the name suggests, it is a simpler commentary, which is why I used Amrta as the main commentary in this edition. The Samsodhini-tika, or Samsodhini for short, is a commentary written by myself, Matsya Avatara dasa, a disciple of Bhakti-tirtha Svami and, at the time of writing this book, a resident of Govardhana. 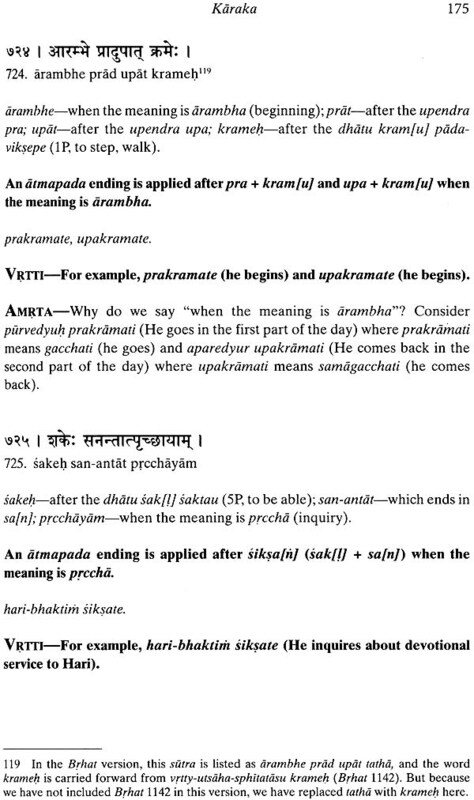 Samsodhini means" corrects and refines." 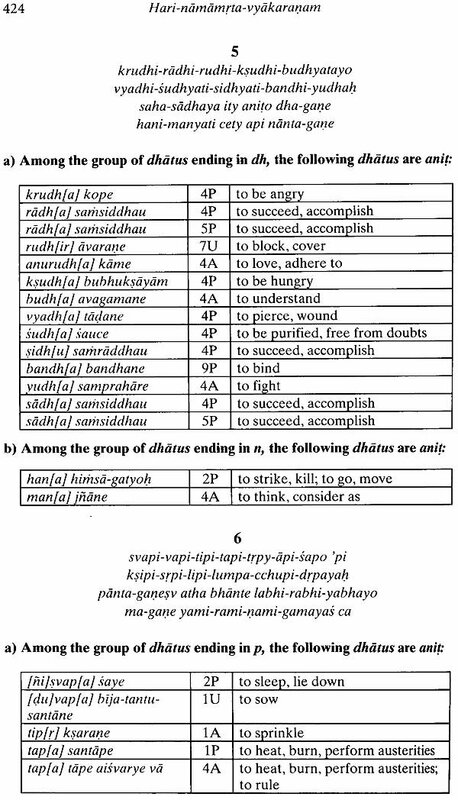 This commentary points out the various apapathas. 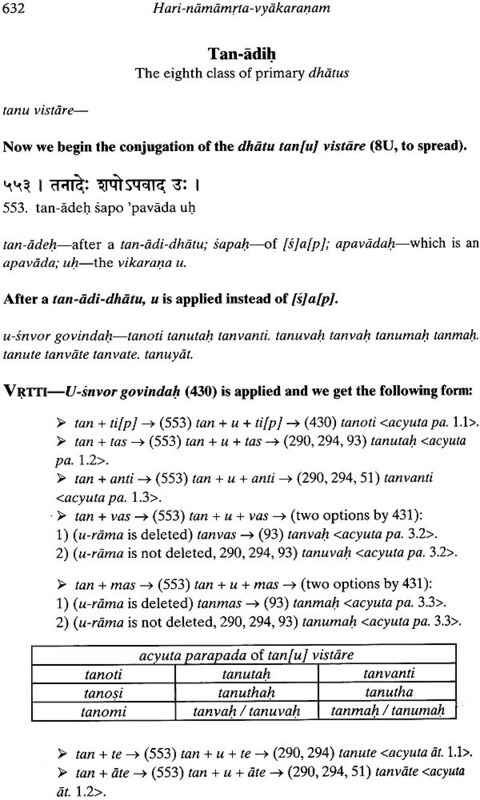 (wrong readings) in Jiva Gosvami's sutras and vrttis and establishes the correct reading through a thorough comparison of all the printed editions of Hari-namamrta, cross-checking of the Amrta and Bala commentaries, study of the equivalent Paninian siuras, and examination of ancient hand-written manuscripts in the Vrindavan Research Institute," Furthermore, it helps to refine the student's understanding of the subject matter at hand by adding further clarification on particular points and by giving relevant examples and counterexamples. 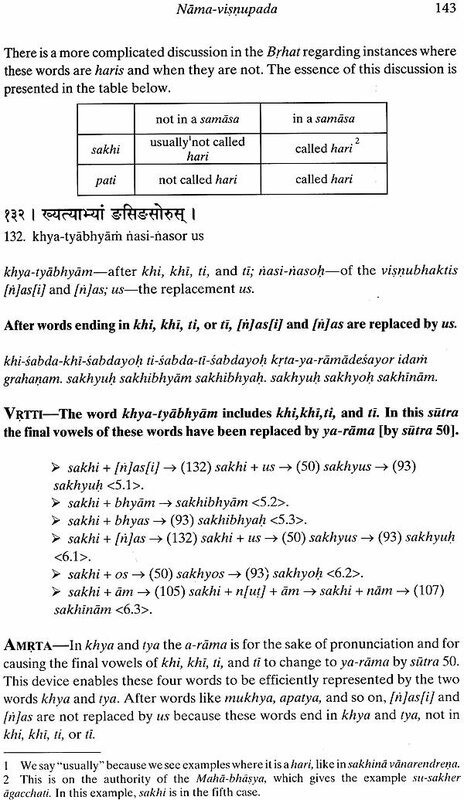 One should know that whatever appears as footnotes in this book is also considered part of the Samsodhini-tika, and so are the words in square brackets within the Amrta commentary.